To purchase a decommissioned police car, most of the time we’re left fighting over a bruised up Crown Victoria with 170 thousand miles on the odometer. Not today. At least, not when it comes to three Chevrolet Caprice Police Patrol Vehicles, one of which is the detective package, listed on eBay. The first Caprice PPV seems to be in the newest condition, with a scant 260 miles of usage. Bidders looking to “Buy Now” can have it for under $26,000 out of New Braunfels, Texas. 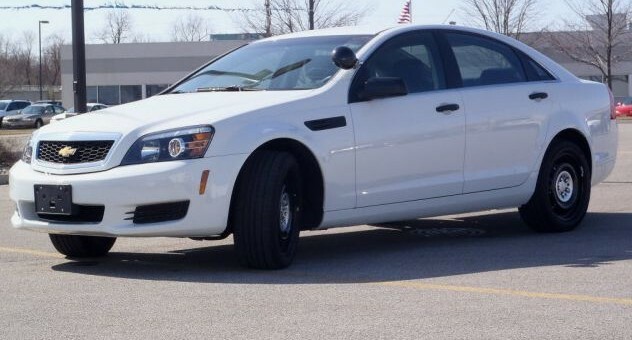 The second Caprice is a sharp and monochromatic white out of Peoria, Illinois with 9,300 miles, but with minimal background information. This V8-powered sedan is going for what seems like a steal, with the current bid at $21,700. Lastly is a red Caprice detective vehicle out of Bloomington, Illinois. While we’re not sure if it was one of the models that were originally sold to the public via a sales loophole, it’s definitely the one we want. And for $26,000, it’s hard to argue with the price. And if you’re impatient for a sporty Chevy four-door, chances are it will be cheaper than a shiny new Chevy SS sedan. These might even become collector’s cars someday. Would Elwood buy one as the new Blues Mobile? Can you ask the dealership to take a couple more pictures of the car and post them. There were only 79 pictures!!!! Yeah I counted them because it was ridiculous. I think we missed a picture of the gas cap. Is the dealership staff photographer a Japanese tourist? I looked at them all and they were all slushboxes. I’ll have to pass. Auto’s shift faster, and cops need less distraction during pursuit or loafing about. A manual transmission would interfer with their work or leisure. Every police car sold in the U.S. is automatic, and the Holden this car is based on is auto-only. Hope the new owners enjoy them lucky dogs !! The Carfax shows it was first sold at a Honda Dealer? Seems a little strange. But this isn’t one from the sales loop hole, it was bought by the state of Michigan, then was sold at public auction.